The largest group of homeless people are single men. 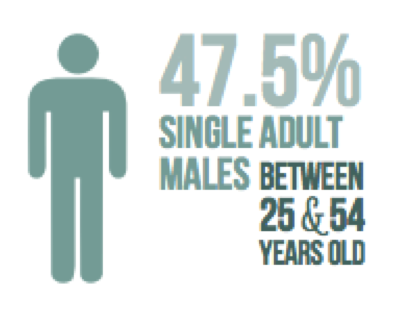 According to the State of Homelessness in Canada: 2013 adult men between 25 and 55 years of age represent almost half (47.5%) of the homeless population in Canada. A study that explored only homeless shelters found that in 2009, 73.2% of shelter users 16 and older were male. The gap between males and females widens with age so that while males make up 60% of the youth population in homeless shelters, they make up nearly 80% of adults over 55. Register for the Community Workspace on Homelessness to discuss single men in homeless populations.